28 Mar Sheer Wedding Joy and Shimmer Paper Perfection! What could be more lovely than a spring wedding with handmade invitations. With so many to make, the design should be fast, elegant, and simple. Shimmer paper, in cover stock, allows you to use a very simple design. 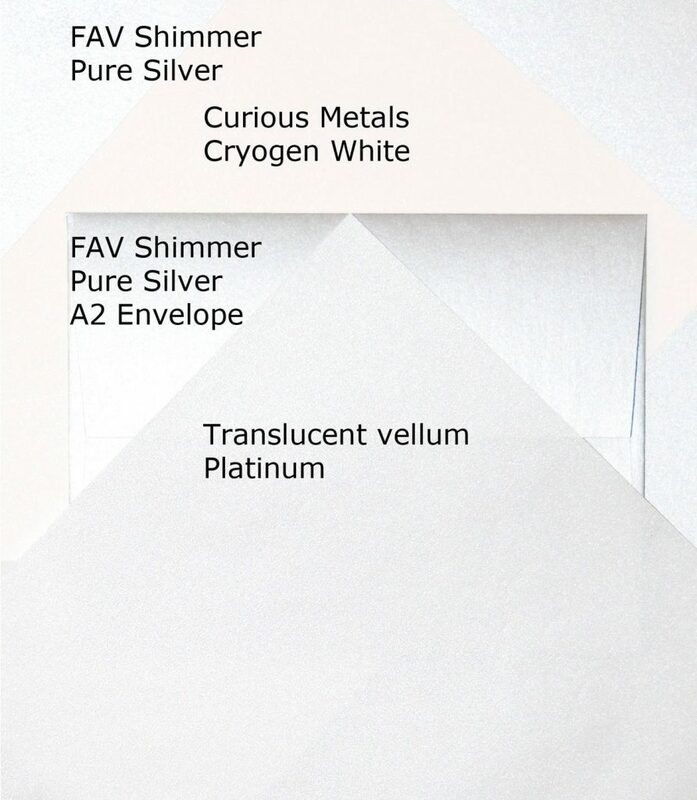 Paper-Papers, PPS, FAV Shimmer, Pure Silver, is very elegant and also has matching A2 envelopes. The paper is a mixture of pigments and iridescent particles; the sophisticated mix creates a surface with a metallic glitter that is luxurious to the touch and pleasing to the eye. 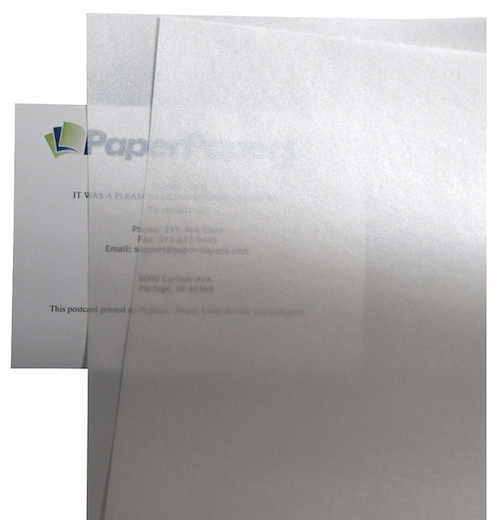 The paper is laser and ink jet compatible, if you want to print the envelopes. This silver pairs perfectly with Curious Metallics, Cryogen White, which is a milky white with very subtle shimmer making it the absolute best complement to these other shimmer papers. Cryogen white is a soft white that folds perfectly. The invitation itself is laser printed on Platinum, Translucent Vellum, both flexible and shimmery; a wonderful match to Pure Silver. 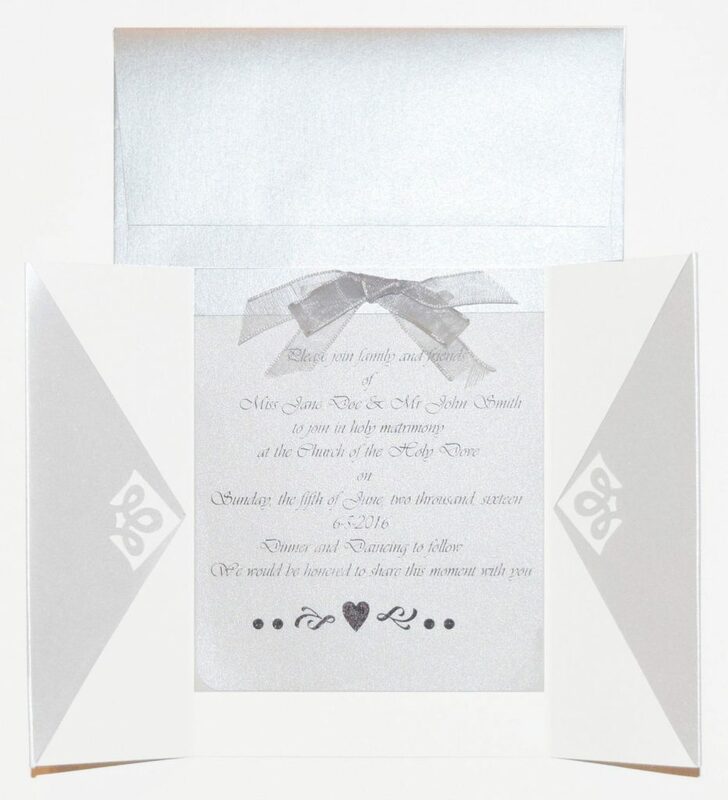 The Silver A2 envelope size, 4 3/8″ x 5 3/4″, allows for 2 invitations per sheet of Cryogen White, with the Platinum Translucent allowing for 4 invitations per sheet. 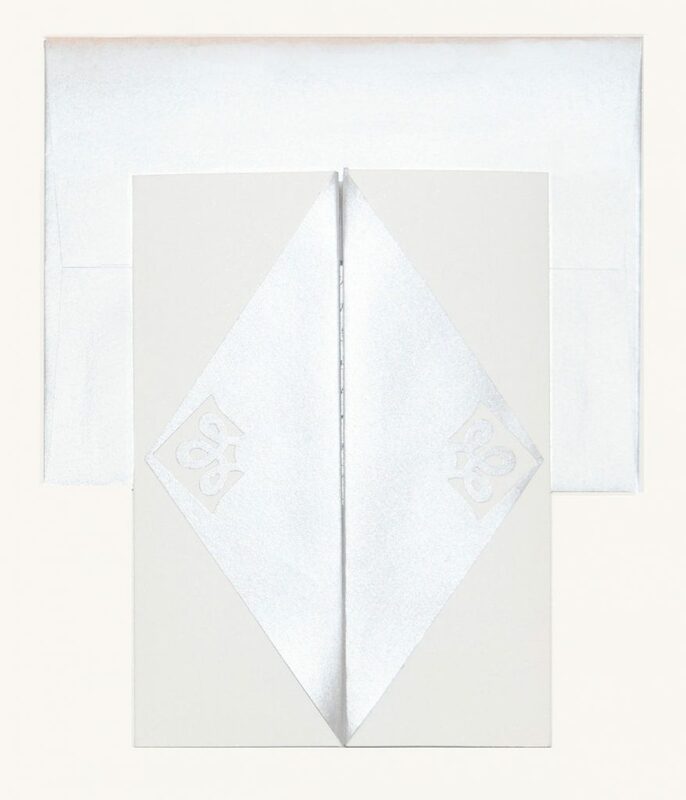 The trifold card is 4″ wide, centered on a half sheet of Cryogen White. Center the 4″, score and fold. There is a 1/4″ overlap that can be folded back, under the silver, or just trimmed. The Pure Silver overlays are 5.5″ squares that were trimmed, after cutting, and scoring diagonally, to overlay 2″ on both the outside and inside, and held down with ScorTape. After trimming, use a corner punch for a simple design. The invitation was printed, then cut, with a 1/2″ x 4″ piece of silver trim taped over the top and finished off with a little silver bow. The design at the bottom on the invitation was from the fonts that came with my printing program. Your guests will treasure these keepsakes.